As promised, here is a picture overload of My Winter 2012 Mantel. First, I need you to know that it is challenging to decorate my mantel because it is over 8 1/2 feet long and is 5 1/2 feet high. The height makes it difficult because, one is viewing the mantel in an upward fashion vs. straight on. The sheer size of the mantel makes it hard to decorate because I have to fill the space with more decor for a cozy look. Now let's dissect my mantel...In pictures! I purchased this Britney Lowe Snowman with my Christmas $$! Using 1/2 gal. Ball jars, I filled them with tree limbs from my backyard and Epsom Salt. This candle from JoAnn's is filled with Christmas lights and is on a timer for auto night lighting. 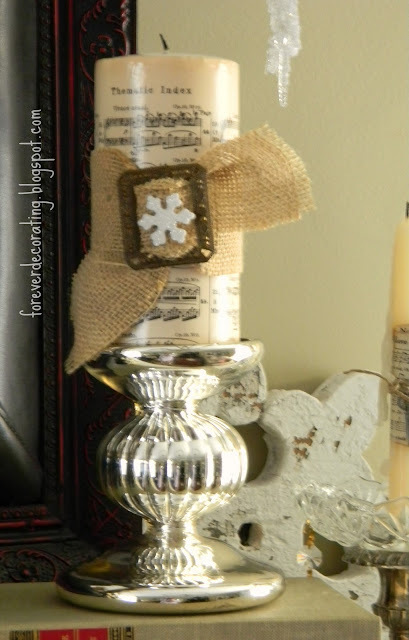 I decoupaged 1916 Chopin sheet music to this candle, then wrapped in burlap & vintage buckle. Ah, there is one of my songbirds.You can view more about him HERE. I made this star wreath from 1916 Chopin sheet music and finished with a burlap rose in the center. I made the center flowers with book pages and sheet music. And embellished with glitter snowflakes, the word 'snow' and burlap ruffles. 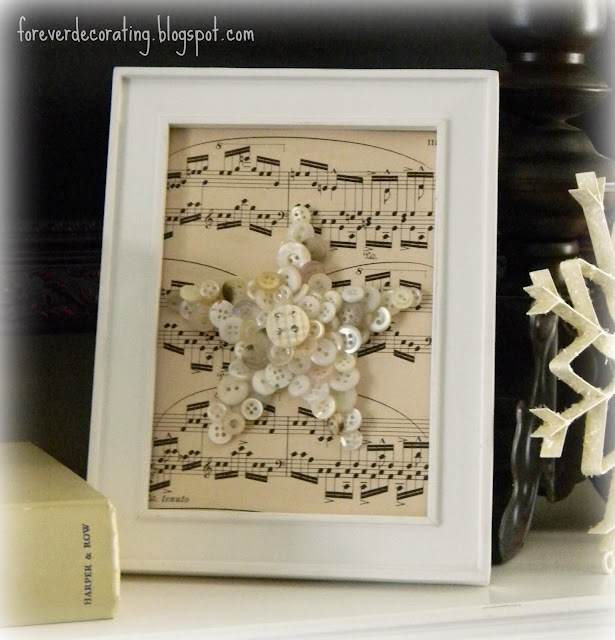 I made this star simply by hot gluing buttons onto paper then gluing that onto sheet music and setting it in a frame. Very easy, especially if you collect old buttons. I hope you liked my snowflake and star themed Winter 2012 Mantel. Coming soon, "The night look" of my mantel. Kiss and Tell @ I gotta Create! Wow! So much inspiration! Lots of really neat details. This was no small feat for sure... It looks lovely! Terry your mantel looks gorgeous!! LOVE IT ALL!! I love it all, too - my favorites are the songbirds, mercury glass, and (swoon) snowman. I pinned the pic of him. Wow! Love everything! From the snowman, the button star and the star wreath! Girl, you are amazing! Very pretty! Epsom salt makes great snow. I love using it. Your mantel is so lovely. I would keep it just like that all year long. Love the button star too. I just LOVE that snowman! I do a tablescape (I don't have a mantel) and needed some idea for my table now that Christmas has been packed away. That is an adorable winter mantel, I know what you mean about a long mantel, mine is 71/2 ft long and always a challenge! You met the challenge of a large mantel beautifully! Your wreath is to die for. I love it all. I love your winter mantel. That is one of my projects for this week too. Yours came out beautiful. Thanks for sharing at DIYbyDesign. Oh, I love it all!! 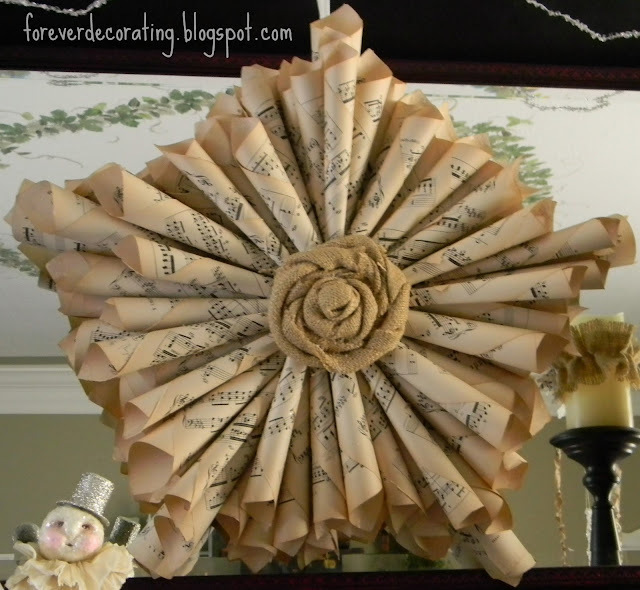 Especially that music paper wreath, love it with the burlap rose! Beautiful job! Love love love your mantel! It's just perfect! Ok, I want to pin almost every pic! LOVE, LOVE, it!!!! So lovely! 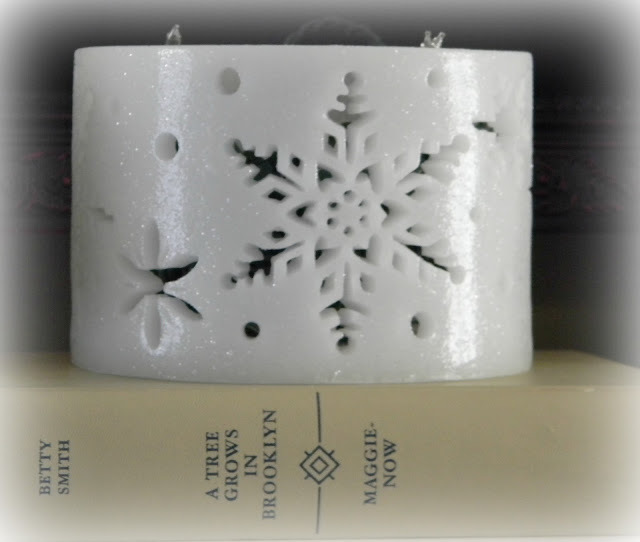 I really like the candle you decoupaged with sheet music. Very Pretty! 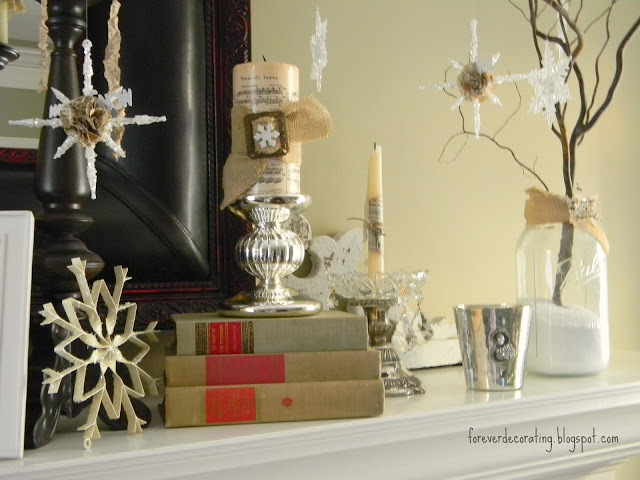 Love the book page wreath and button star! Looks great! The white and silver look so prett together. 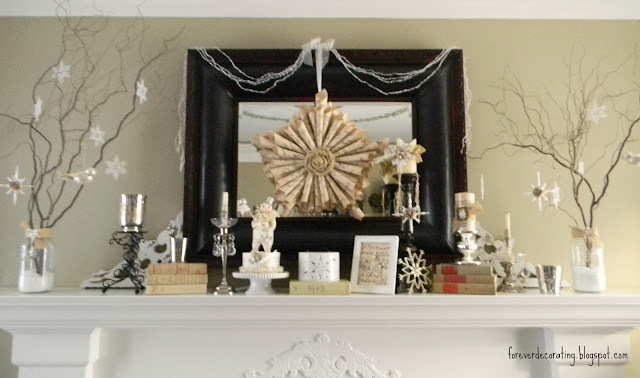 I just love how you decorated your mantle, it is just gorgeous! I have never seen a star wreath like yours and was wondering if you did a post on it. I would love to see how it is done. Thanks again. I love your star wreath!! Beautiful! My goodness you have given me sooooo many awesome ideas...I'm so going to make that button star!!! You have so many great elements here! I love the wreath and the big jars with the branches -- great idea with the epsom salts -- so pretty and sparkly! I have a large vase to fill for my Valentine mantle -- I may use the salts with a few sparkly hearts mixed in! Thank you for linking your gorgeous Winter mantel to Potpourri Friday! Just gorgeous! I l.o.v.e. 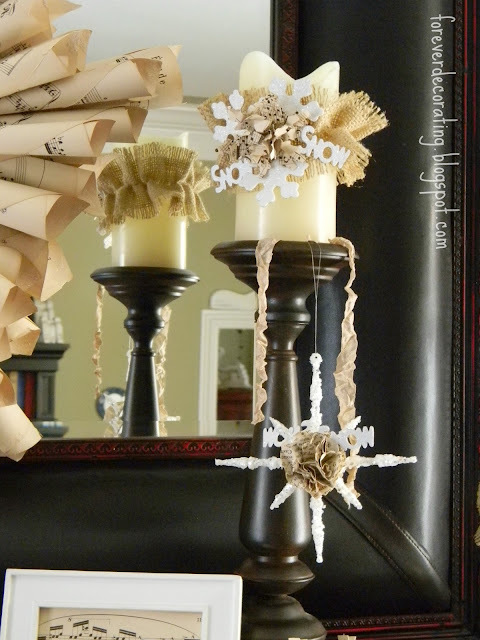 your star sheet music wreath and all your other sheet music crafts. So pretty! 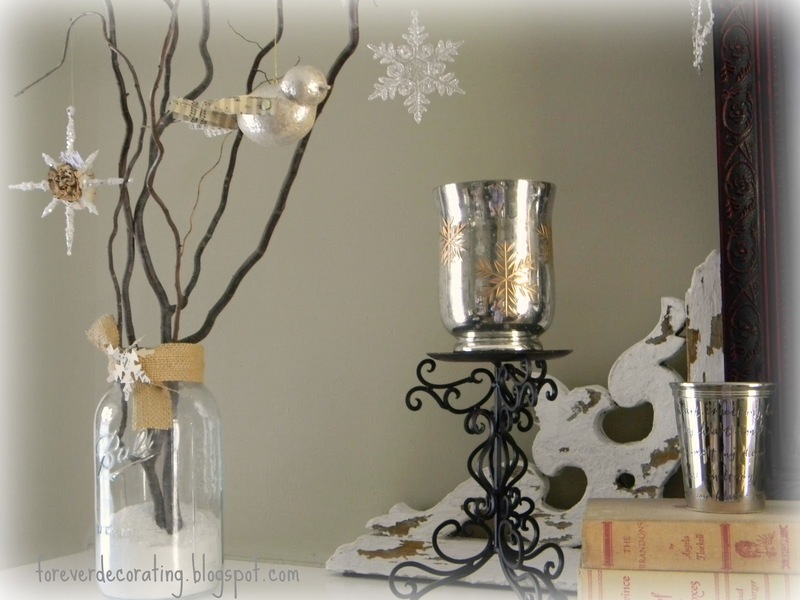 Thanks for linking up to my Winter Mantle Party! 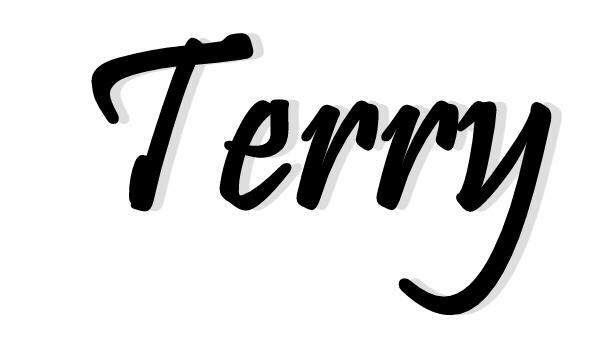 Hi Terry! I love your mantel, but what I especially love is that most of your decorations are DIY! Great job and it's beautiful! 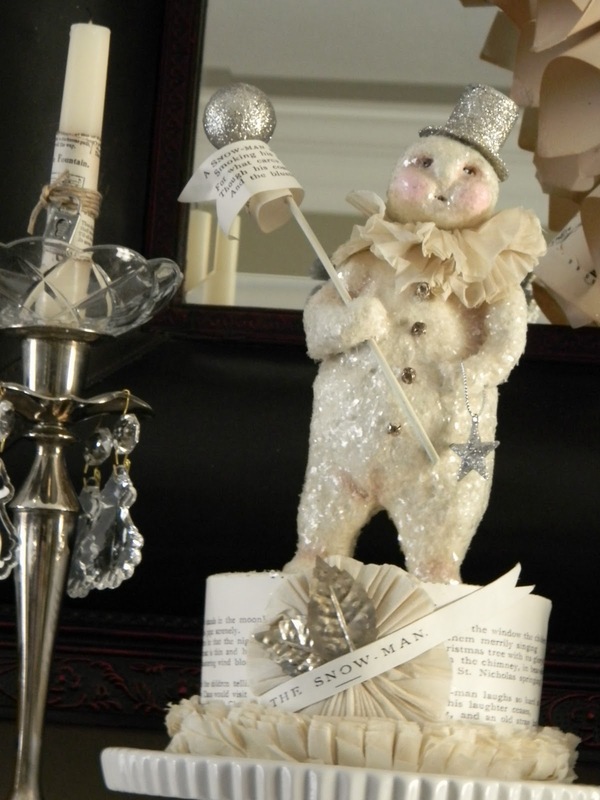 Great mantel Terry, you are very crafty and every piece is so creative. Well done! So pretty, creative and stunning too! You are certainly a talented lady and I am always happy when I get a chance to stop by! Beautiful!! I love all the wintry details! I would love it if you linked it up at my very first link party!! Wow that Chopin Star is incredible, visiting from the CSI project. Your mantel is gorgeous. This is beautiful!!!! I love the snowflake made out of buttons on sheet music. Oh my!!! That combines so many things I love! Thanks for linking up to the CSI Project. Looks great, I love the snow man! Love It Terry! Thanks for visiting my blog and for the lovely comment. I LOVE Bethany Lowe. Her work is just beautiful! Check out my features-You did it AGAIN--you're in my TOP 10. This is my first time i visit here. I found so many entertaining stuff in your blog, especially this post. 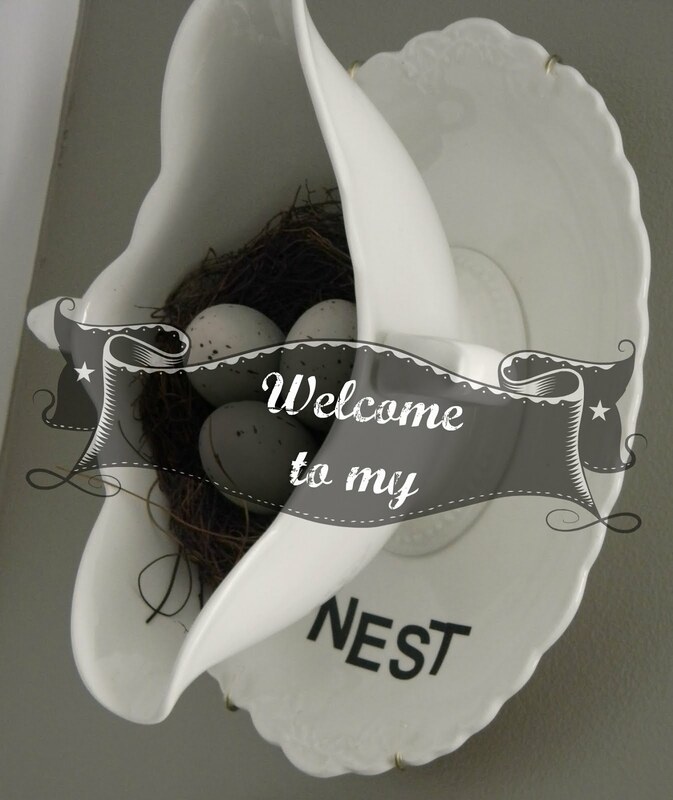 I like the decors you have put in here. Love it! 23 days to a New Garage!